When I first browsed through the book, all I saw was too much information. Just from the index I could tell that there were too many countries and too many reformers from each country. I thought it would be an overload and I would finish the book without knowledge about anything in particular. But how wrong I was. After reading the book I can still say it has lot of information but everything is so nicely structured that I could go read it in sections without getting overwhelmed. It was definitely not an overload and I could tell how important it was to include as many reformers as possible. I would feel bad if even a single among them was excluded and I feel there was still room for more. Every countries section begins with a brief but concise history of the reformation with how the countries past and present has affected the position of the women for better or for worse. Under each country we have the information on different women reformers and the work they have done and are still doing for the betterment of women. It also lists the awards won and books written if any and the various organizations that are working towards a single goal-the betterment of women. I found Muslim Women Reformers an awesome resource on the work done by women from different Muslim countries. Although every country has it’s own laws, one thing remains common-the exploitation of Muslim women in the name of Islam. The problem is combining religion and politics and hence the misinterpretation of religion to achieve the political goals. Since most of these politicians are men, they use Islam as a way to keep women out from what they consider their territory. But women are learning to interpret Islam the correct way which is helping in fighting with these fundamentalists. These are the women who are fighting for basic rights, both political and personal, and suffer tremendously for it. I am amazed by their courage and determination at the cost of their personal lives. The saddest part probably is that these women have to fight even for basic things like custody of their children, honour killings, right to decide if they want to wear a veil and right to express their opinion; and although it is a slow process, there is definitely progress in many parts of the Muslim world. I am in no situation to say how accurate or inaccurate this information in this books is but I have faith that the author has done enough research before writing the book. I also understand that there are exceptions everywhere. For me, this books definitely deserves a place on my shelf. I highly recommend it. Set in small town Jullundur (Jalandhar) in Punjab, Witness the Night is the story of a 14 year old girl Durga caught in a nightmare and a 45-year-old social worker Simran who is working hard to find out the truth. When 13 people from a rich and prominent family are killed one night, 14-year-old Durga, the daughter of the family and the only survivor, is the main suspect. When Simran, a fiercely independent and outspoken social worker arrives in Jullunder to speak with Durga and find out the truth from her, she realizes that the incident is not as straight forward as it seems. Durga looks like a scared child but she keeps mum about the incident. It is up-to Simran to find out the truth on her own. As she tries to uncover the truth, she finds that the relationship of Durga with her family has sinister undertones to it. I cannot tell you how much I loved this book. It deals with a very important subject about female infanticide and the place of women in a conservative society. I could tell the author is passionate about the subject. But in no way does it get overbearing or boring. It’s also a page turning mystery where we are kept wondering till the end about how it happened. Although we know what happened by the first page itself, it’s still a mystery about why someone would wipe an entire family out. The book is written from 2 viewpoints, Durga’s and Simran’s. While Durga’s writing is serious and dark, Simran’s is sarcastic and funny at times. She is a very interesting lady and I especially enjoyed her interactions with her mother. Overall this is a mystery that is different from many mysteries out there because not only is it page turning but it also deals with a very important subject with honesty and fearlessness. My review doesn’t do the book justice. You have to read it to see how wonderful it is. Highly recommended. Witness the Night is the winner of 2010 Costa First Novel Award. Normally I wouldn’t have picked this book up because it seems like it’s aimed at teens. I love YA but I usually stay away from books that revolve around school like because I don’t really seem to connect. But Populazzi I picked because it’s written by Elise Allen who is a 2011 Debutante. Cara is a teenager who is a nobody in school. The fact that she peed in school when she was a kid followed her as she grew up and stopped her from climbing the social ladder. But when she changes school she decides to start with a clean plate. Her best friend Claudia, makes a plan for Cara to climb the ladder and thus become popular in her new school. The plan is to start dating guys starting at the middle level and then gradually climb up and date the most popular guy and hence become the Populazzi. It’s actually a pretty predictable plot. It started off very interesting and funny. I was engrossed until her first two boyfriends, Archer Jain and Nate. But after that it just seems like a drag. It’s a pretty believable story though. I can totally see teenagers relating to it. In spite of the topic of the book, the author has tried to maintain a sense of right and wrong throughout the book. Cara definitely knows the difference but still goes with the flow. It is also probably one of the very few books with an Indian American as one of the important characters. So that was kind of refreshing. The writing was free-flowing which helped but I can’t deny that I was a little disappointed in the book. But I liked the writing so I will definitely pick up her next book if the premise interests me. I seem to be in the minority as the reviews on Goodreads are very good. More than a Memory is a collection of essays, prose and poems. 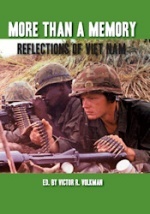 This collection has stories and poems written by those who had fought the war in Vietnam and lived to tell the tale. Some stories/ poems are about survival, some about finding your comrades dead beside you and not being able to do anything about it, some are about adjusting back into the real world where a single loud noise could take you back into the Vietnamese jungles, some are about dealing with post traumatic stress and some are about hope. As it a collection written by different authors,I thought some were well written ans dome were not, but all were worth reading. It has more poems than stories and prose though, so if you hate poetry stay away from it. I am not a fan of poetry either but I read every single poem in this book. That’s saying something. I’ve had this book for some time now but what kept me from reading it was that it was the second book in the Homelanders Series. So I did what I usually do when faced with this dilemma. I read the spoilers reviews of the first book on Amazon after checking if the library had the first book. I was very happy to know that not many people were satisfied with the first book since it left a lot of questions unanswered. It seemed like the first book was kind of a build up. So I jumped into the second book and was hooked right from page 1. In the first book ‘The Last thing I Remember’, a high school student Charlie West went to bed as an ordinary guy and woke up to find out that the police as well as the bad guys are after him. A year has passed by and Charlie doesn’t remember any of it. I didn’t really know how much he found out about himself in the first book but it didn’t matter because I didn’t feel like I missed a lot. I think it was because the author covered the gaps successfully. When this book opens Charlie is surrounded by the bad guys, supposedly the terrorists who want to destroy America by recruiting Americans who are against the country. After escaping from them and then later the police, Charlie goes to his town Spring Field to find out the truth. That is where we learn about his friends, his school and his teachers and what could have gone wrong. I was on the edge of my seat for the entire book which was also a very fast read. What I didn’t understand was the terrorists role in all this. They were always in the background and the reasons were not really enough for me to believe that they were a danger to Charlie. Charlie was too good a kid which could actually work well since this is a YA novel. Charlie could be a good role model. Also there are absolutely no bad words. Even though it’s an adventure involving terrorists and a murder, it is a very clean book. At times I found the language very simple and forced. It could be because this is the first YA series that the author has written. But he is the recipient of 2 Edgar awards, so what do I know. Anyway, recommended for YA lovers and those who love adventure and mysteries.